❶ The option “Copy originals to selected languages” allows to create translations in bulk into other languages. It copies all the post content such as the title, the content (text, media, gallery) and the excerpt into the selected languages. ❷ The option “Synchronize originals with selected languages” allows to synchronize in bulk the original posts into other languages. It means that the content of new translations will be synchronized to the original content. Indeed the translations as well as the original posts will have the  icon activated in the Languages metabox as explained in the synchronized posts documentation. 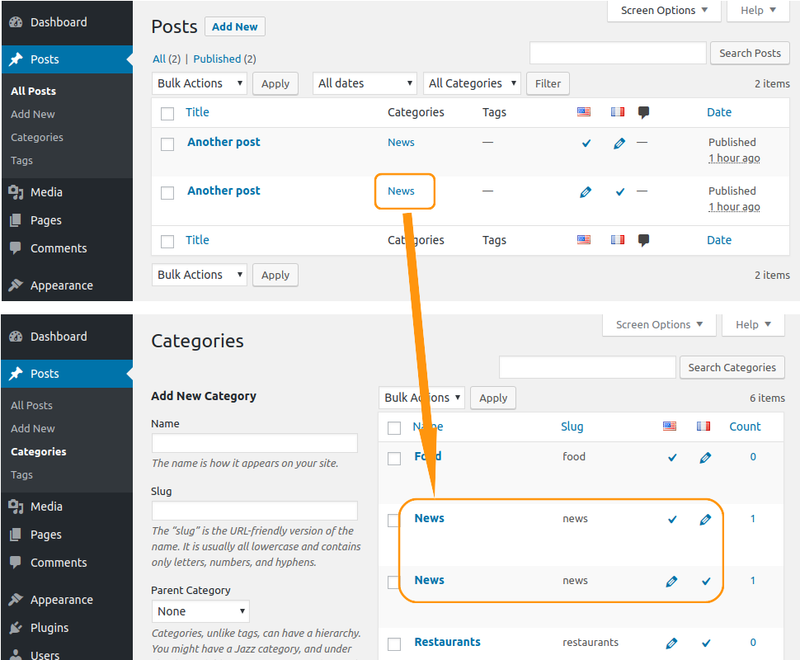 This tool works with posts, pages, media (except for the synchronization option) and custom post types such as WooCommerce products. 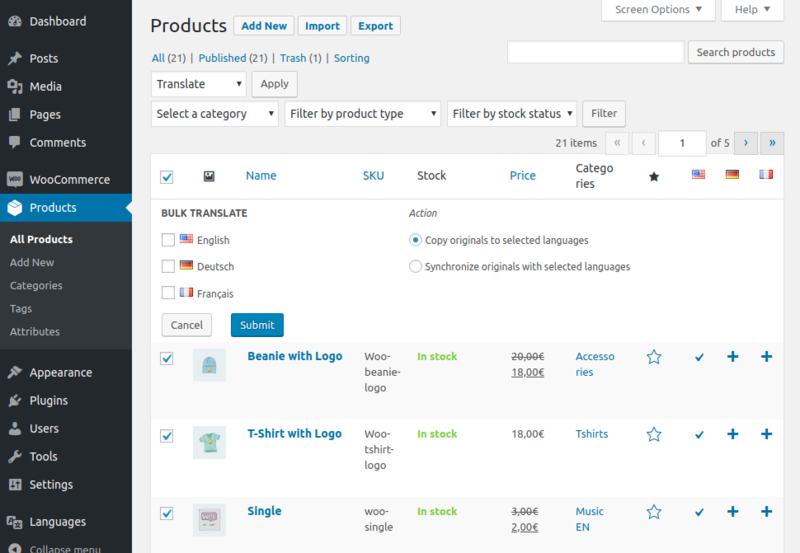 As a reminder you need Polylang for WooCommerce to handle your products. 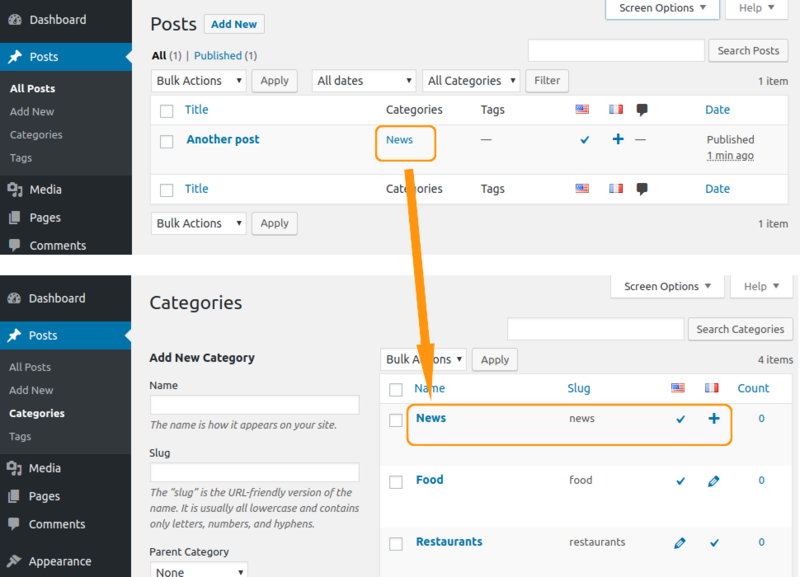 The example shown below is for posts but the bulk translation tool works the same way for pages, media (except for the synchronization option), and custom post types such as products. ❺ then hit the « submit » button. Note that if you select « Synchronize originals with selected languages » the synchronization will be activated for your new translation as explained in the “Synchronized posts” documentation. In the following example, you will see that if the translations of the categories don’t exist yet, Polylang creates them automatically on the fly. It works the same way with custom taxonomies such as WooCommerce product categories. To translate this post in another language you need to proceed as explained in the previous example. 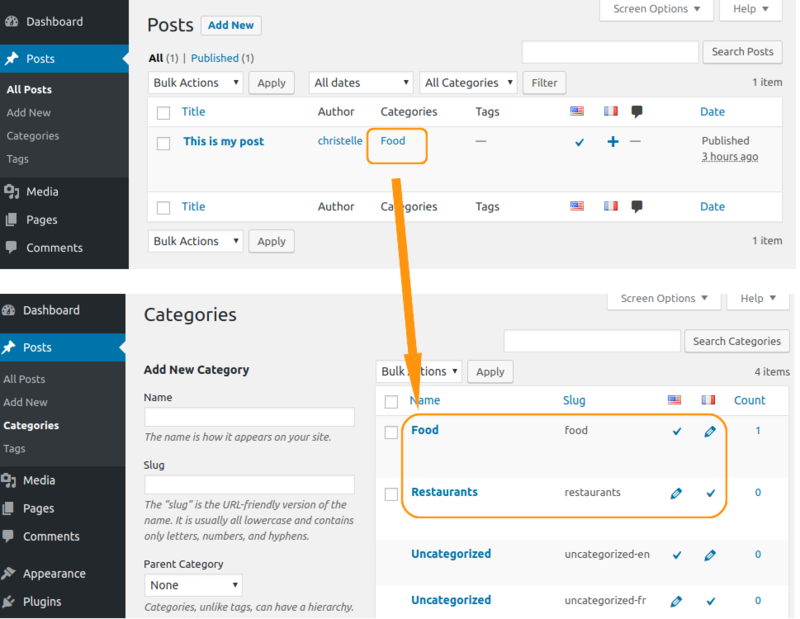 After bulk translating your post, you will obtain a new French translated post with a new French category. Indeed Polylang has created the “News” French translated category on the fly as shown below. Note that it’s up to you to manually translate the title of this just created category. The behavior described above is the same for the media, if the translation doesn’t exist, Polylang creates it automatically. Note that if your products categories and your terms are not yet translated, Poylang also duplicates them automatically into the other languages.